UNDER CONSTRUCTION until End of February 2019. FINAL BRAND NEW BUILDING. RECEIVE $5000 IN CLOSING COST ASSISTANCE, THIS Richmond Floor Plan, is an end unit with rear Covered Lanai and Courtyard adjacent to 2 Garage in rear. Spacious open concept flowing floor plan with formal living room that can be used as an office or den. Laundry closet is located upstairs for convenience,All Energy Star stainless steel appliances are included with 42" kitchen cabinets in Espresso brown with crown molding. Ceramic tile in all areas except the bedrooms and staircase. Master suite has a large walk in closet, dual vanity sinks with Quartz counter tops, privacy lavatory and over sized seamless glass shower. Crystalline glass-insert front door 6"x 36". Lanai area and courtyard include brick paver. R-38 Insulation throughout, average monthly utility bill runs about $85 a month. 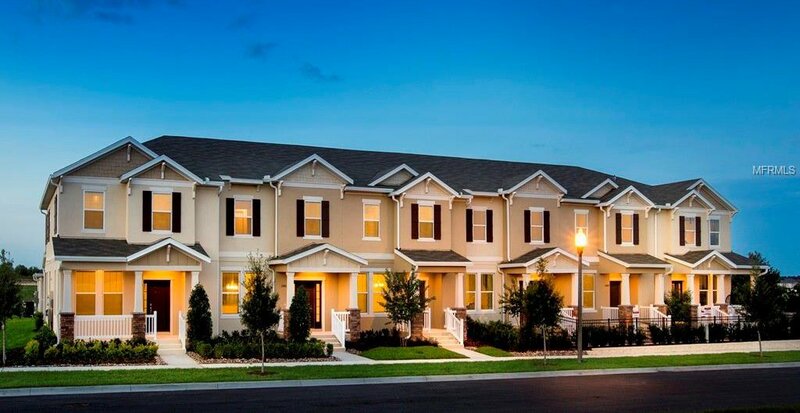 Community is conveniently located 1.5 miles to Disney, Orange county national golf center is 3 min away, 25 min from downtown Orlando, and public boat ramp to Windermere chain of lakes is 9 min away. Don't miss your LAST CHANCE to own your slice of heaven. Listing courtesy of FUSILIER MANAGEMENT GROUP. Selling Office: HOMEVEST REALTY.